"I'm fairly impressed by the format you use to teach tuning techniques, and I'm very impressed by the convenience of having tools supplied with the course." 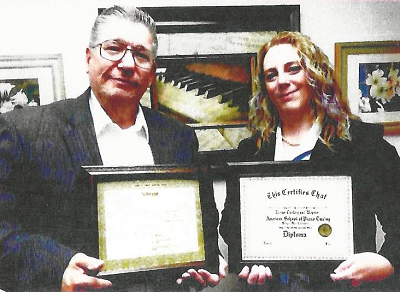 Receive their diplomas 46 years apart! "At the age of 19 I saw an advertisement in a trade magazine that was for the American School of Piano Tuning. An aunt of mine stated that if I would pay for my schooling then she would purchase my first piano tuning machine as a gift for me. I readily accepted her offer and have benefited greatly until today. The correspondence course was easy to understand and affordable. I could make progress at my own rate. I graduated from the School on the date of February 19th, 1969. By choice I decided to let Piano Tuning be a supplement to my teaching. Over the years I received many benefits. Early on in my piano tuning career I worked for a local music store and this gave me much needed experience. I have become more skilled and adept at my tuning so that now ... on average it takes just a little over an hour to tune a piano and make a net of $85.00. Piano tuning has proved to be a steady supplement. "I have always had a strong passion for music. My interest in tuning began about 6 years ago when I had my own piano tuned. I watched in wonder as the tuner delicately tuned each string and brought my piano out of its dull, clunky, off-key sound and into its full ability to create beautiful music. I remember asking a lot of questions, to the point that he offered to take me on as a student. Unfortunately at that point in my life I was not in a position to change careers, but the fascination with pianos had already set in. A couple years later I was married to a soldier and facing the career instability challenges that come with being a military spouse. At the time, my sone was taking piano lessons, and the teacher, Joe Kurz, was also a tuner; a graduate of The American School of Piano Tuning. He came to my home to tune up my piano, and again I found myself asking too many questions for him to make good time tuning the piano. Fortunately he is a very patient man. My interest in tuning was growing and the idea of learning the trade was beginning to take hold. About 10 months later, he came back to adjust my piano again, and I asked him to teach me. That began a roughly year long journey of taking apart pianos, watching him tune pianos, helping tune and replace strings. I decided to supplement my apprenticing with a formal trainging course just to make sure everything I needed to know would be covered. Knowing that Mr. Kurz was a graduate of The American School of Piano Tuning, there was no question for me where I would attend. He had been a successful tuner for over 40 years. The coursework and year-long apprenticeship that I completed has given me a really comprehensive and hands-on training. At one point, Mr. Kurz brought a 105 year old upright piano over to my house that had been sitting in a storage unit for several years and was in very rough shape. His only instruction - make it work. As I would complete my lessons, I would work on the part of the piano being taught. Many times I would have to refer back to the manual to figure out exactly what I was supposed to do, and a few times even got stuck and needed to consult with Mr. Kurz. I removed rust, reset pins, replaced key tops, flanges, springs, felts and punchings, hammer butts, shanks and hammer heads, voiced hammers, shored the bottom so the pedals would work, and tuned it up. I got the poor old piano into working order and even managed to coax a little music out of it.